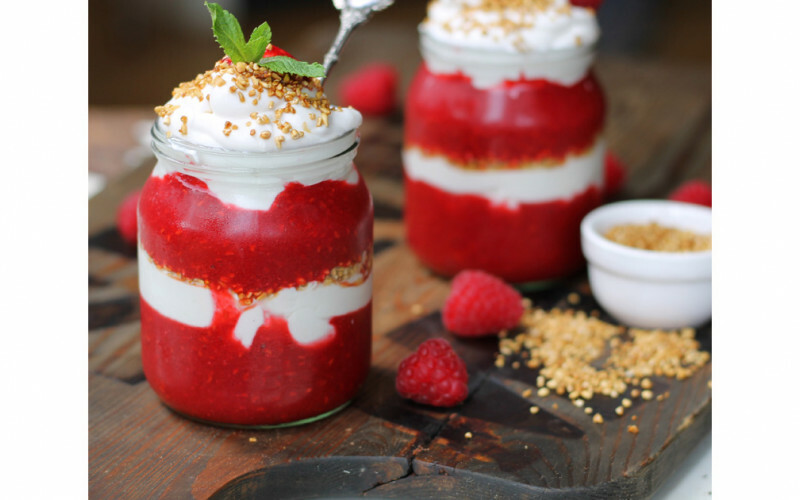 Traditional Scottish Dessert with Layered Raspberries, Whisky Cream & Toasted Oats. Cranachan is often served on Burns’ Night but is lovely any time of year! Use leftover coconut cream in other dishes, eg curry or soup – or freeze it for another time. 1. Chill the cartons or tins overnight or place in the freezer for half an hour or so. It needs to be very cold. 2. Place the cream in the glass bowl and whisk it. Add the cream of tartar and whisk again. 3. Drizzle in the sugar slowly until it has mixed in and dissolved. Stir in the whisky and make sure it is well mixed in. 4. Return the cream to the fridge or freezer while you make the rest of the dessert. 1. Mix the chilled vegan crème fraiche with sugar/agave to taste and the whisky. 2. Return to the fridge or freezer until ready. 1. Blend half the raspberries and sweeten with sugar or agave to taste. 2. Keep the other half whole and set a few aside for garnish. The majority go in the layers. 1. In the frying pan, toast the oats and sugar carefully, stirring constantly so they don’t catch. 2. When they smell sweet and nutty, remove from the pan and place in a bowl so they don’t continue to cook. 3. Crumble three quarters and leave the rest for garnish and texture. 1. Set out the four glass containers. 2. Place a layer of the puréed raspberries in each container. Spoon in a thick layer of cream then a teaspoon or so of the toasted oats followed by whole raspberries. 3. Repeat the layers until you run out of ingredients. Garnish with a few whole raspberries. 4. Serve immediately or chill for a short while but don’t let the oats become soggy!